*full disclosure: this critic has worked on some publicity for Circle, earlier in 2015. **there are some spoilers here. Cast: Julie Benz, Mercy Malick, Carter Jenkins and Autumn Federici. Circle is a psychological horror feature. From Taggart Productions and Votiv Films, the film stars Julie Benz (Saw V), Mercy Malick, Autumn Federici and Michael Nardelli. 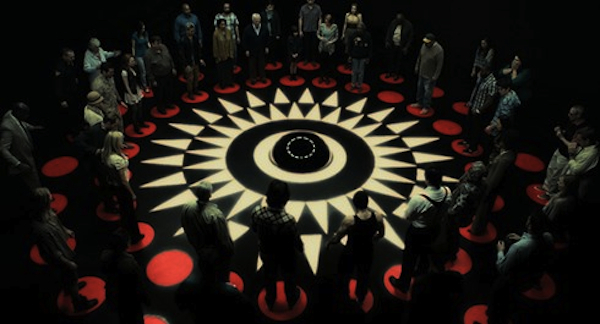 Circle had its World Premiere at the Seattle International Film Festival, in May of 2015. 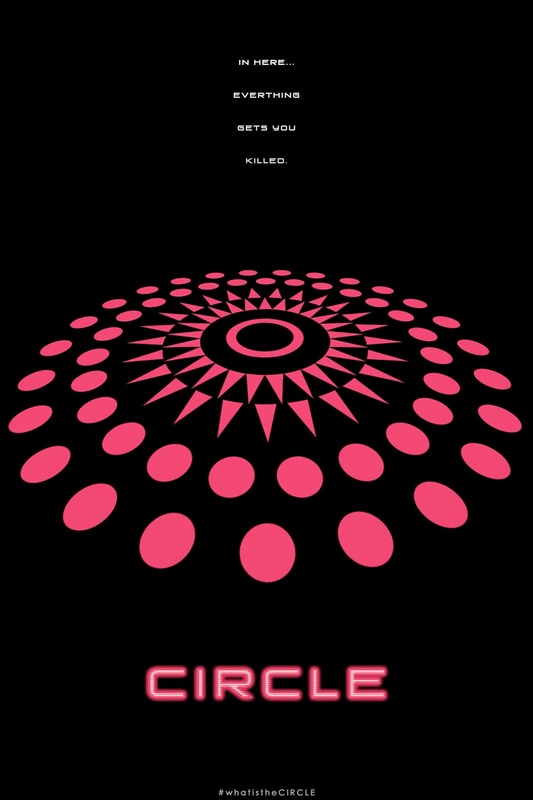 And, Circle is a compelling feature that looks at people's inherent biases, in a psychological fashion. The characters are diverse, but most of their motivations are unified by their will to survive. Though, some find their own demise a little quicker than others. Overall, the film is an entertaining feature. But, the social message is a little disconcerting; dishonesty has its rewards. The film begins in a large black room. A machine lies in the center, with fifty characters pointed inwards, towards the machine. Every two minutes, a character is killed by an electrical zap. There are two rules: you cannot touch your neighbour and you cannot step off a small circular pad. Characters must work together, if they hope to survive. But, there is no truth to be found here as the machine goes about its brutal work. Instead, a psychological experiment is taking place. Who is running the experiment? It is time to thin the herd. The characters are intriguing and diverse. The room consists of certain stereotypes. But, some of the characters show a stronger intellect than others. Others are motivated to protect a certain vulnerable person or two. Meanwhile, a couple of others are hoping for divine intervention. God must have been too busy to stop these murderous events. As the film progresses, many of the survivors deepen their characterizations, while others do not grow at all. One character, who lives for an unbelievably long time, does not speak throughout the entire film. It is difficult to believe that a mute would survive this competition, into the final few and this is a competition, which requires participation. The most compelling characters are those that force others to come to terms with their dire situation. The film's social message is an unaffecting one. The closed ending reveals that a very dishonest character has won the prize - survival. That is an amoral message. Many of the most dishonest characters live the longest. But, should not honesty pave the way to success? The film is mostly meant as entertainment. But, it's inner message is slightly flat; dishonesty helps you live. Still, the film seems as if based on the long running reality show, "Survivor." In this show, the most conniving win and the film likely borrowed its morality from this series. And sometimes, an honest message is difficult to sell as it offers less conflict, amongst characters. The psychological elements, within Circle, are very strong. The dire situation forces the characters to dialogue together. 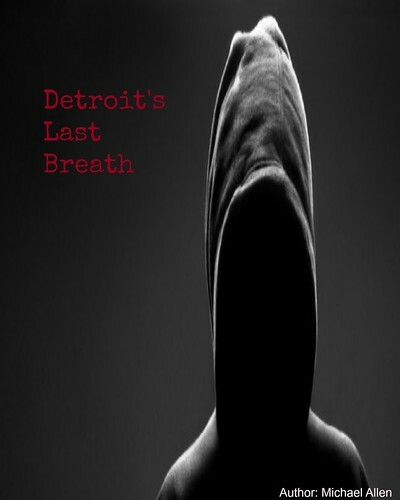 They are hoping to find a way out of the killing room and they soon discover that it is possible for one person to live. Along the way, the try to uncover whether the characters are related to each other. Some, lie about their commonalities, while others have loose connections to each other. One character tries to save his life by communicating his victimization, due to race. However, race has little to do with who is chosen. Only a pregnant woman and a young child seem to have any natural immunization, to being chosen for death. Still, the guillotine must come down on fourty-nine. These fourty-nine must convince the others of their need to live, or they must vote in a block. Biases, including racism, class, sexual orientation and social dependency, all come into play as the beam shoots its killing gaze about the room. This film critic really enjoyed the film and others will too. 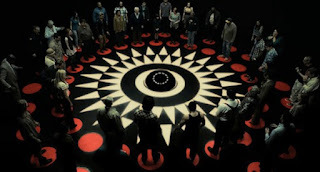 Recently released on Netflix (US), Circle looks at the inherent vices and biases some people have. The film may even draw you in enough, in which you you try to figure out your own strategy for survival. Though, this critic would die quickly as honesty does not get many of the characters very far. Plus, voting for others to die is equally unvirtuous and in actuality murder. And, few of the characters have many qualms on voting for another to die. Even when characters die, the survivors seem unaffected, but why? Do people really have so little connection to humanity? The film would say yes. But, this film fan believes that people are a little less brutal and more honest, in reality.